Some of you may know that I am an alumnus of Clarkson University, whose Division I Women’s Hockey team are the defending National Champions. I watched both the Men’s and the Women’s games when I was there (2004-2008), but as the Women’s team had more compelling players and was generally better, I went to more of their games. Women’s hockey remains an under-covered sport with information on USCHO.com pretty lacking and I thought I could learn a lot if I dug into the stats a little bit. For those of you that are familiar with advanced stats, this will be old hat, but for those that aren’t, one of the best ways to track the general skill of a team is through shot attempts (shots on goal + missed shots + shots taken that get blocked) versus the opponents’ shot attempts. Generally the team that takes more shots is controlling more of the play and is better at hockey. It’s not an exact science, and it may be less useful at the NCAA level where there is a wider gap between the best and worst players (and teams), but it’s a fairly accurate predictive stat. Unfortunately, so far as I can tell, only shots on goal are recorded in Women’s hockey so that limits things a bit, but they can still be used to get a general idea of who’s controlling play and by how much. I called this stat Shots Percentage, or S%. Quinnipiac outshoots their opponents 40-10 every game. Their S% is therefore 80% (40 shots taken divided by 50 total shots). This seems like a good thing, but when we look at Quinnipiac’s opponents we find that they were outshot 40-10 every single game. So their OPP SA% is 1 minus 10 divided by 50 or also 80%. Quinnipiac’s 40-10 performance isn’t exemplary considering the quality of their opponents (everyone outshoots them 40-10), it’s merely average so their Relative Shots Percentage (Rel S%) is 80%-80% or 0%. To see how teams fared against the best opponents, I did the same calculation for every team only considering opponents that had a positive shot differential or a S% above 50%. 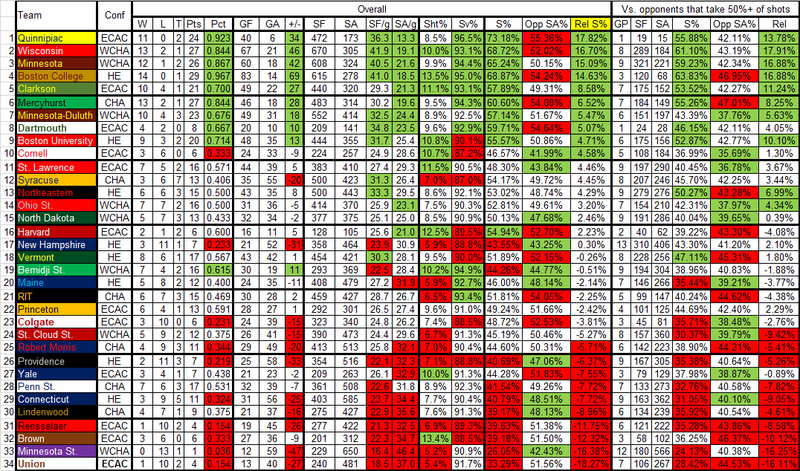 I do have figures for conference play, but chose to focus on the overall picture. Rel S% is in yellow because that’s what I chose to sort by. The top 10 teams in each category are in green and the bottom 10 are in red. Quinnipiac, Wisconsin, Minnesota, Boston College, Clarkson, Boston University, (and arguably Mercyhurst and Minnesota-Duluth) are really good. Union and Minnesota State are really bad. Everything in between is pretty much a crapshoot, although I think Dartmouth, Cornell, St. Lawrence, Syracuse, Northeastern, Ohio State, North Dakota, Harvard, Vermont, and Bemidji state are the best of the remainders. But on to the rankings, and more importantly what that means for the NCAA Tournament selection process. The USCHO Poll is exactly what it sounds like, the USCHO writers vote, those votes are summed, and the teams are ranked accordingly. As I said, the top six are pretty indisuptable. 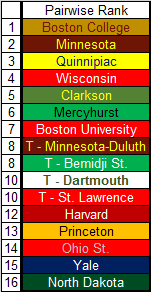 It’s clear here that voters did not value Mercyhurst’s easy schedule although curiously Minnesota-Duluth is ranked low even though their only losses are to Wisconsin and Minnesota in regulation (they beat Minnesota in a shootout) and to North Dakota (who was ranked #10 at the time) in overtime. If Mercyhurst’s crap schedule is worth less, certainly Minnesota-Duluth’s difficult schedule is worth more, right? Apparently not. Contradicting this, Bemidji State benefits from two wins over North Dakota and two wins (one in the shootout) over Minnesota even though their other four wins aren’t very impressive (Robert Morris x2, Rensselaer, and Vermont), and they have two losses to unranked Ohio State (5-1 and 1-0). As for Harvard…who knows. They have wins over putrid Rensselaer and Union, ties against Clarkson and Boston University, and an overtime loss to St. Lawrence. They’ve finished in the top 3 in the ECAC every year since 2006-2007 so they’ll be a factor down the stretch. “…compares teams with an RPI over .500 (Teams Under Consideration or TUC per the NCAA Women’s Division I ice hockey championship manual), judging them by these criteria: record against common opponents, record against teams under consideration, head to head competition, and the Ratings Percentage Index (RPI). I will note that the women’s RPI rankings are not up to date on USCHO.com so it’s unclear what sort of value these have if any. Assuming the RPI is up to date somewhere and isn’t a mystical number pulled out of the sky, Princeton gets credit for beating a bunch of teams that are terrible (and Cornell!) even though their shot numbers are attrocious and Yale gets credit for tying Boston University. Dartmouth, like Harvard, just hasn’t played very many games, although they look okay, and North Dakota has a shootout win over Wisconson and an overtime win over Minnesota-Duluth. They also have two losses to Bemidji State (4-1, 2-1) despite winning the shot battle in both games (27-26 and 32-18). I think Clarkson is better than Quinnipiac and Boston University even though Clarkson is 0-3 versus those teams. I think Minnesota State is better than Union by, like, a lot even though Union has better shot numbers. The WCHA is amusing, the top tier teams haven’t played many non-conference games (why bother?) and the lower teams have (presumably to get a breather from getting clobbered by Minnesota and Wisconsin). Then there’s Minnesota State, whose lone non-conference opponent is Mercyhurst. You go Minnesota State. Yeah…I think they’d clobber Union. The closest we’ll be able to get to knowing for sure is seeing how they fare against Lindenwood on January 9th and 10th. Syracuse has had some impressive showings, a 2-1 loss to Clarkson (after getting drilled 9-0 the night before), the school’s first ever victory against Mercyhurst and two close games against Vermont. They also have the lowest save percentage in the NCAA and their shooting is bottom ten. It sounds to me like a classic tale of mediocre players playing well in a good system (instituted by Paul Flanagan who SU poached from St. Lawrence and has 5 Frozen Four appearances on his resume) and the benefits of a fairly easy conference. The Women’s NCAA tournament is tricky, there are only eight spots, and four of those go to each Conference’s Tournament Champion. (At least I assume so, USCHO.com doesn’t actually say, but that’s how the men’s tournament works.) In a perfect world, Minnesota or Wisconsin win the WCHA, Clarkson or Quinnipiac win the ECAC, Boston or Boston College win Hockey East, and Mercyhurst wins the CHA and no one has an issue with any of the autobids. The losers of those teams in the WCHA, ECAC, and HE all get at-large bids and the final spot goes to the best among Minnesota-Duluth, St. Lawrence, Cornell, Dartmouth, Harvard, North Dakota, Bemidji State, Ohio Sate, Northeastern, Vermont, or mystery team. Arizona State is getting a Division I men’s hockey team (Most of the Pac-12 plays hockey as an inter-university club sport), which some think could lead to an NCAA hockey Pac-12 (or 10, or 8), which (it stands to reason) could lead to the same for the women. There are several men’s teams in Michigan, Nebraska, Colorado, and Alaska where it would make sense to also have a Women’s program. I don’t think you can justify a tournament expansion to 16 with only 34 teams at present, but if you can add another conference and make an eight team jump to 42, it’s definitely a possibility. And with the field currently producing 10-12 good teams every year, it stands to benefit the sport more if maybe some bad teams make the tournament as opposed to good teams missing out. And Minnesota defeats Quinnipiac for the championship.